The next president of France will be politician who wants to dissolve the country with a rich history and traditions, firstly, in Europe and then in the world. On the eve of the presidential election, the victory of Emmanuel Macron, the leader of a virtual movement “Let’s Go!” and the henchman of the transnational elites, explicitly demonstrates it and turns the second round of French presidential election into a vain formality. According to the last data published by Ministry of the Interior in France, Macron topped the first round with 23.75% of votes. The leader of the right conservative National Front, Marine le Pen, took 21,53%. Thus, both of them have advanced to the second round that will be held in two weeks. The candidate of the center-right party “the Republicans”, François Fillon, earned 19.64% of the vote and took third place. The forth place went to the leader of the far-left movement called “Unsubmissive France,” Jean-Luc Mélenchon with 19,64% of the vote. The rest 7 candidates came in last of the main contenders, includingthe candidate of the ruling Socialist party, Benoît Hamon, with 6.2 percent of the vote. How did the election pass? The election has become the most cynical election in the history of France. Macron was announced as a winner, according to the exit-polls, while the situation was not clear enough. Before the preliminary results were presented, he got congratulations on the victory from main French politicians and abroad. Even Fillon, whose program was not different from Le Pen’s program, called to vote for Macron because “an extremist party is getting closer to power”. He meant the National Front. The vividness of Fillon’s speech shows that if he had become the second in the first round and won the second round, he would not have fulfilled his “right” pre-election promises, including his promises to cancel the anti-Russian sanctions and establish closer relations with Russia. He did it only because he wanted to attract Le Pen’s supporters, and he, finally, succeed in it. 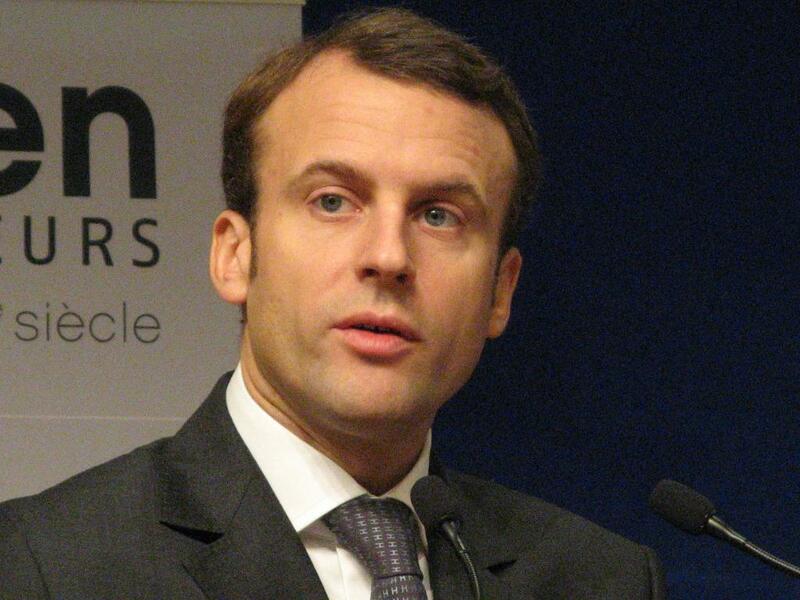 Emmanuel Macron, 39, was born in the family of doctors and raised in the town of Amiens in France. He studied philosophy in Paris Institute of Political Studies, famous Sciences Po, wrote course papers on Machiavelli and Hegel. After studying Machiavell, he found out that you could not earn money on philosophy and entered the elite École Nationale d’Administration (ENA) in Strasburg - the classic postgrad route of France’s political elite. However, he bought himself out of his government contract quickly and found a highly-paid job in Rothschild & Co in Paris where he proved himself as a thrusting investment banker in order to get into François Hollande’s “socialist” government. In 2012, he was appointed as the deputy secretary-general of the Élysée Palace and two years later as Minister of Economy. Therefore, he can be highly responsible for a hard situation in economy that the country is facing now. The Rothschild’s henchman had an argument with labor unions about the disputable reform of labor market. After several confrontations with Prime Minister Manuel Valls in December last year and understanding that socialists would gain nothing, he left his post of economy minister. As soon as he, suddenly, received money, he set up a virtual movement “Let’s Go!”. This movement is virtual because it does not have members, membership fees, party membership cards. It consists of “activists”, who are sponsored by the globalists and supported by left-centric politicians, mainstream mass media. The movement is backed up by Macron’s strong PR campaign and Macron’s statement that “he is neither left nor right” but a new word in French politics. If not the globalists, Macron would have been blamed that his movement “Let’s Go!” was created by “Russian hackers”. But, of course, no one blamed a liberal “humanist” and “convinced European”. Even the reasonable accusations of corruption, more serious ones then those that destroyed the pre-election campaign of republican Francois Fillon, did not harm Macron’s image. What did Macron prepare for the election? Macron’s pre-election program is very similar to the pre-election promises of Bolsheviks: he promised what everyone wanted to hear and he understood clearly that it would be impossible to fulfill the promises: left and right parties, ecologists, liberals, patriots could find something that was close to them but, in general, all of these promises could not be fulfilled. How it is possible to talk about decreasing 35-hours working week, which is already seems outrageous short; decreasing enterprise tax from 33,3 up to 25%; decreasing unemployment from с 9,7% up to7%; cutting state expenses to 60 billion euro; providing everyone with free glasses, dental prostheses, hearing aids; allocating 50 billion of euro to the programs of development, modernization of infrastructure, renewable energy sources, climate protection; cutting 120 thousands of officials; increasing expenses on army and police. Every sensible person can understand that this mutually exclusive program is fake. Unfortunately, the quarter of French did not think so. Also, Macron suggests opening boarders, thinks that terrorism is inventible and warns the French that they will have to live with this evil. He supports suctions against Russia, Western policy to dethrone Bashar Assad in Syria, and promises that he “will make Putin to respect him”. In reality, he makes fantastic promises but they stay just promises. Macrons says that “refugees are resistant and progressive people” and he praises the immigration policy of Angela Merkel who let more than one million of immigrants enter Germany during one year and saved “the dignity of Europe” in this way. Sum up, all people got non-fulfilled promises, and France, in general, got the presidential candidate who dreams about the country’s dissolving in Europe of refugees and then in the whole world. Marine Le Pen and her party, the National Front, are also celebrating a victory. The result of the first round is their record: they have not received such number of votes in the presidential election and have not advanced to the second round before. The leader of the National Front says that this achievement is “historical” one, “first step of French people to the Élysée Palace” and claims that “it is time to free French people”. In real, Le Pen took more than 7,65 million of the vote, in general. Just to compare: she got 6,4 million of the vote in the first round at the presidential election in 2012 and took the third place. In 2002, Marine Le Pen’s father and historical leader, Jean-Mari Le Pen could get 4,8 million of the vote in the first round and 5,5 million of the vote in the second one. “We heading for the second round of the presidential election” – Le Pen announced and added that she had “a great responsibility in protecting French nation, its unity, security and culture”. And it looks like this in reality: Le Pen is for Europe of nations, stopping illegal immigration, refusing from euro, full reformatting of EU, cancelling anti-Russian sanctions, fighting with terrorism and Islamism, making friendly relations with Russia. Great and excellent aims. But, unfortunately, in the second round, almost all political forces of France that do not understand their responsibility in the future of the country and people and do not set similar goals are opposing “right “ and “fascist” Le Pen. What did the first round show? Firstly, it showed the crises of government in France. The political system of fifth Republic, which was created by de Gualle almost stopped existing. The representatives of left and right center did not advance in the second round but the globalist’s henchman, liberal, Macron and the representative of right conservatism, Le Pen, did. They will be compete with each other, and in case nothing extraordinary happens in France within two weeks, the leader of the National Front will take 40 % of the vote and the leader of Let’s go – not less than 60 %. Secondary, the presidential election in France is being held in the conditions of the unprecedented split of left parties. However, if we calculate the votes of Mélenchon and Hamon, we will see that left partiescould have taken the first place in the first round. So, we see that the Le Pen’s opponents have a reserve. Her party will be opposed (after the inevitable failure of Macron’s presidency) by the left parties which are the specific friends of the globalists and they will be not split up next time.